What are the misspellings for sail? 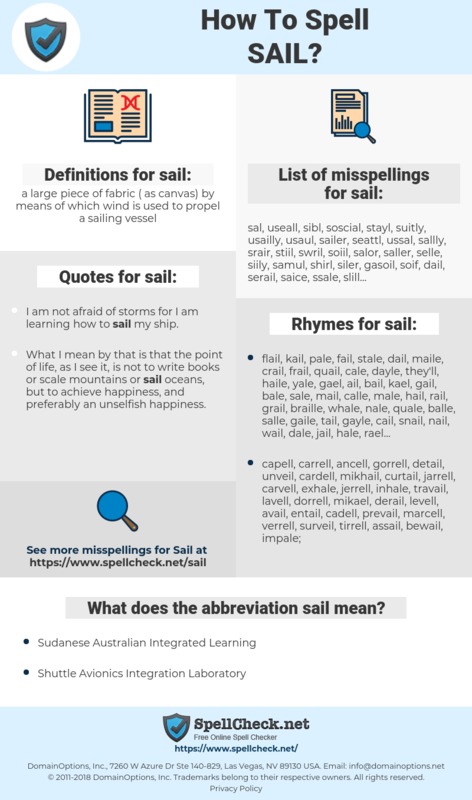 What are the common mistypes for sail? What is the definition of sail? What does the abbreviation sail mean? What are the quotes for sail? What are the rhymes for sail? What are the translations for sail? 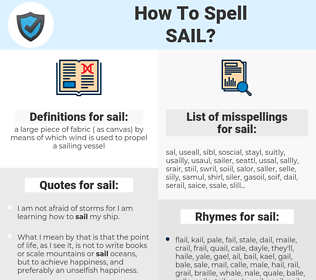 What are the common typos for sail? Sail as a boy's name is of English origin. Name with connotations of the outdoors. This graph shows how "sail" have occurred between 1800 and 2008 in a corpus of English books. We are tied to the ocean. And when we go back to the sea, whether it is to sail or to watch- we are going back from whence we came. If the Spray discovered no continents on her voyage, it may be that there were no more continents to be discovered. She did not seek new worlds, or sail to pow -wow about the dangers of the sea. 航行, 帆, 驶, 帆船, 船帆, 启航. besturen, zweven, glijden, varen, zeil, bevaren, molenwiek. avancer, toile, voile, naviguer, faire de la voile, voguer, appareiller, voilure. ablegen, abfahren, fahren, befahren, auslaufen, rauschen, segeln, Seil, Zeilen, Segel, besegeln, schippern, Segelschiff, Windmühlenflügel, Segelfahrt. salir, navegar, vela, surcar, zarpar, pasear en barco, ir en barco, aspa.